Sfrutta al massimo il tuo tempo in terra croata scoprendo i punti salienti di Spalato e Trogir in solo mezza giornata. Dopo una facile ripresa, recati nella città costiera di Trogir ed esplora la sua fortezza, il palazzo e altri punti salienti mentre impari la sua storia dalla tua guida. Poi, continua a Spalato e visita il Palazzo di Diocleziano, patrimonio dell'UNESCO, la Cattedrale di San Doimo e altro ancora. Excellent tour because of Tina! She grew up in Split and had a thorough knowledge of the history as well as current culture of both locations. When the 5 hour tour was over, Tina gave us great advice on where to spend the rest of our day in Split. We were very fortunate to be the only two on the tour with Tina and the driver, and the fact that our tour wasn't cancelled reflects very favorably on Viator/ Croatian Trails. The tour to Split and Trogir was absolutely wonderful. We had a first class tour guide who spoke excellent English and who gave us a historical overview of the country and the regions were were visiting. The sites were beautiful and we had ample time to see all the places as described on the advertised tour. Our guide stayed with us most of the time but we also had time on our own to explore, take photos and shop. We had a comfortable, clean mini van for the four of us and our driver was cautious and considerate. He stopped on numerous occasions to allow us to take photos. We would highly recommend this tour and we plan to return. Great friendly guide who shared a lot of information on the two cities. We all had a great time. Very nice, new van for transport. We had booked two excursions though Viator Corfu was the other and I can highly recommend them both. There were 20 of us on this excursion and our tour guide Tina was very knowledgeable, patient and funny. The coach was immaculate and everything went to plan. The excursion was organised in such a way as for us to see as much as possible in a short period of time. Infact I had an email to say that due to the amount of traffic the excursion had been swapped around so that we would visit the medieval town of Trogir first and then Split. This gave us more free time to spend in Split where we were able to walk back to the cruise ship. Once again the cost of this excursion worked out less than half the price our cruise company. 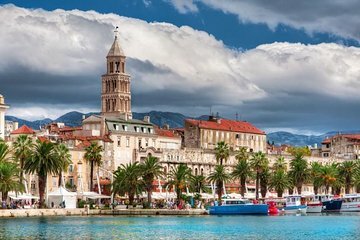 I would recommend anyone visiting this region to choose this option should you wish to visit Spit and Trogir and have a more intimate experience than those offered by the cruises. This tour was wonderful. Tuna was a wonderful guide. So passionate about the history of her native country. One of the most interesting tour we had. Our tour guide Tina was the best we've ever had. She never left our side at the Split precinct to report my stolen wallet. We're lost w/o her. Btw, my wallet was returned intact but w/o the euros. A miracle indeed. Thanks again to our beloved Tina. Having Tina as our guide really allowed us to hear the historical background from a well educated local!! She was lovely and kind and informative. The airconditioned van was a bonus as it was 42C that day!! Our tour guide was Tina and she was amazing! The best tour guide we had during our 7 day cruise through Europe. The tour was long enough to get some awesome and very detailed information. We had plenty of time in both Trogir and Split to explore on our own too. If you are going to Split via cruise ship I highly recommend this tour. As I stated before Tina was awesome. She was full of fascinating information and very personable!